It’s happened. The beginning of the end of buying super expensive textbooks for college, that break your back and have little return on the investment when you no longer need them. That’s right: Amazon.com has Textbook Rentals for Kindle! It’s something that I’ve predicted for a long time, and now that it’s here, I can see it revolutionizing student life on campuses everywhere. 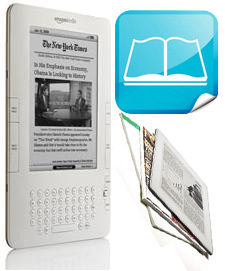 There are two eReaders that are available either now or soon. I was doing some research on Amazon.com’s Kindle 2, which was announced yesterday, and found it to be a very good step up from the original, according to reviews that I have read. It also has instant access to Amazon’s Kindle store without needing a wireless hub or internet access, which is a great plus. But then I stumbled onto a post on Twitter about Stanza, created by LexCycle. Someone said that Stanza is the reason that no one will ever need a Kindle. So I looked that up, and found that it, too, is a potential option. The only thing is that I’d need an iPod Touch. Not only that, but the books look like they’re cheaper on Stanza. Sure, they don’t have the same level of selection as Kindle, but they do have the books that I would want. The real downside is that you need a wireless connection to make the connection. In fact, both devices offer all of the books that I would love to be able to have with me wherever I go. And this morning I discovered Plastic Logic’s eReader, which seems like it won’t be available for at LEAST a year. So I’m at a loss for what device or software would best serve my needs / wants.